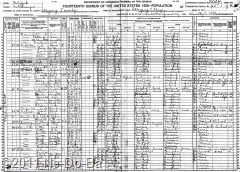 1920 U.S. Census, Allegany, Cattaraugus Co., NY, pg. 4A, dated the 10th & 12th of January, 1920. Lee O’Netto, head, female, white, age 50, single, can read & write, she and both parents born in NY, she is currently self-employed as a Medical Doctor, she owns her property free of mortgage. This woman was born about 1870 according to her age in this census. This is obviously not the same woman I found with Charles Dodge and next to Layton & Marleah in the 1892 NY State Census. Mrs. Dodge was born about 1850. So I have established there are indeed two women working as Doctors and using the “Lee O Netto” name. Based on the death notice for Henry Isaac Kanistanaux, this Allegany woman is his sister. But, where is she in the 1875 & 1880 Census at age 5 and 10 respectively? Why isn’t she with her brother and parents? Why isn’t she a Kanistanaux? Lots of questions pass through my mind and lots of research to do here. This woman is identified as white and she is not called an “Indian” doctor in this census, but rather a Medical Doctor. I need to check on the medical laws for this time period to see if a license is required to practice medicine. I am not sure when such laws went into effect, but if required then perhaps I might learn where she was educated or what her birth name was. I also note she owns her property, so a review of land records for Cattaraugus County should go on my to-do list.